Equipment failure resulting from TOVs can be reduced by proper coordination of the line fuse and MOV. Real world electrical environments in residential, commercial, and industrial facilities experience the gamut of undervoltage and overvoltage disturbances. Examples of undervoltage disturbances include voltage sags, momentary interruptions, and long-term undervoltages. Examples of overvoltage disturbances include surges and temporary overvoltages (TOVs). There are also a number of surge sub-categories—ring wave surges and combination wave surges, for example. Ring wave surges typically do not cause damage to line fuses and metal oxide varistors (MOVs). The combination wave surge, on the other hand, typically does cause line fuse and MOV damage and failure in end-use equipment. MOVs are designed to dissipate the energy that results from a surge voltage. This energy is a product of the clamping voltage and the resulting flow of surge current when the MOV clamps the surge voltage. With proper coordination of the line fuse and MOV, equipment can be protected from multiple ring wave and combination wave surges of less than 4,000 volts. MOVs are not designed to protect equipment from TOVs, but equipment failure resulting from short duration and lower magnitude TOVs may be reduced by proper coordination of the line fuse and MOV. 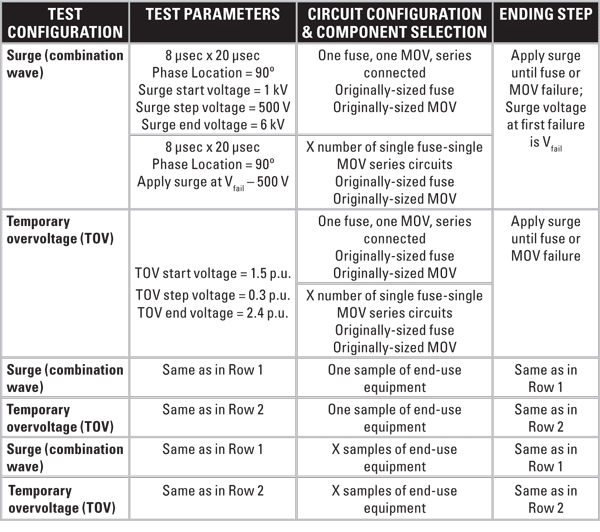 This article first discusses the industry standard definitions for a surge and a TOV and describes the basic overcurrent and overvoltage protection circuits used in end-use equipment. Next, the article describes some characteristics of real MOV failures caused by surges and TOVs and provides some brief discussion on the coordination of line fuses and MOVs. Finally, the article presents a basic approach for determining how a line fuse and MOV will react to surges and TOVs, followed by actual test data. This information can be useful to equipment designers in determining the cause of line fuse and MOV failures and in sizing the line fuse and MOV to provide adequate protection against surges and thus reduce nuisance equipment failures that can drive up the cost of repairs and warranty claims. WHAT IS A SURGE VERSUS A TEMPORARY OVERVOLTAGE? Because TOVs and surges are both overvoltages and can cause damage to equipment, beginning equipment designers just becoming familiar with the different types of overvoltage electrical disturbances in the areas of power quality and system compatibility engineering may confuse a TOV with a surge. Also, designers may not be familiar with TOVs. A TOV can easily be confused with a surge. To distinguish the differences, let’s start by examining the industry standard definitions developed by the IEEE for both surges and TOVs. The IEEE Standard C62.41.1-2002 is the document that provides the best comprehensive technical definition and description of surges and TOVs. Definition 1: “A transient wave of current, potential, or power in an electric circuit. NOTE: The use of this term to describe a momentary overvoltage consisting of a mere increase of the mains voltage for several cycles is deprecated. Comment: This is a generalized definition of surge. For power systems, surge (also called a transient) is a subcycle overvoltage with a duration of less than a half-cycle of the normal voltage waveform. A surge can be of either polarity, can be additive to or subtractive from the normal voltage waveform, and is often oscillatory-decaying.” IEEE Standard C62.41.1-2002. Each of these definitions of the word surge was developed by the IEEE PES during various standards development activities. Definition 2 was developed for power systems instrumentation and measurements within power engineering. Here, surges that occur on the power system can affect instrumentation and measurement equipment used in the power system. Definition 3 was developed for transmission and distribution systems within power engineering and SPD applications. The previously mentioned IEEE 1250-1995 (R2002) also adopted this definition with reference to upsetting equipment sensitive to voltage disturbances. Definition 4 was also developed with application to SPDs within power engineering. Definition 4 is the more recent definition of the word surge as developed by the IEEE SPD committee within C62.41 and is most widely applied to end-use equipment. This definition defines a surge as a transient wave that can be a current, a potential, or a power wave. It is also described as a subcycle overvoltage event with a duration less than ½ cycle (i.e., 8.33 milliseconds for 60 hertz systems and 20 milliseconds for 50 hertz systems). Reviewing each of these definitions, one can see that a surge is technically described as a transient (i.e., short-lived disturbance) phenomenon of positive or negative polarity that can be representative of a rapidly rising voltage, current, and/or power, and that a surge may occur in the power system, electrical networks (e.g., facility power systems), and/or within equipment (i.e., end-use devices). Figure 1. Basic relationship between magnitude, duration, rate of change, and equipment damage for voltage disturbances. IEEE C62.41.1-2002 also defines surges and TOVs graphically on a magnitude- duration plot with respect to the duration of an event (in milliseconds) and the magnitude of an event (in volts). 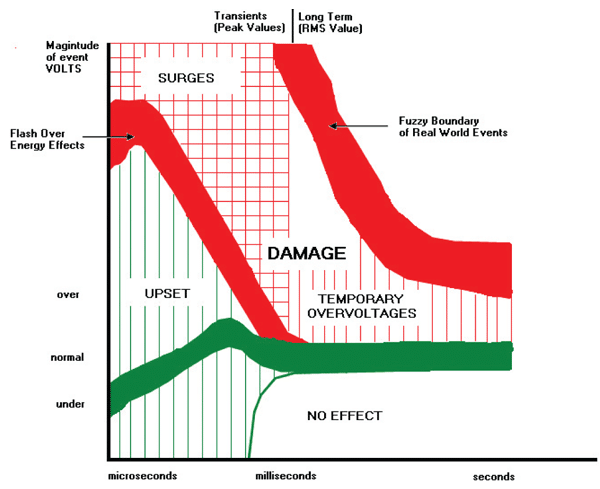 According to these definitions, surges are transients of positive and/or negative polarity with duration less than ½ cycle (e.g., a few microseconds to a few milliseconds), and TOVs are positive polarity events of long term duration ranging from seconds to minutes. In Figure 1, the surges cover a wider area on the magnitude-duration plot than TOVs. Surges incident upon end-use equipment (either through the AC power input or through communication or network cables) can damage, upset, or have no effect on equipment. TOVs are only incident upon the AC power input of equipment and typically cause damage to equipment. With respect to magnitude, surges reach much higher magnitudes in the few thousands volt range with the higher magnitude events occurring in the positive region of the plot—above the normal line voltage. TOVs reach much lower magnitudes in the overvoltage range within a few hundred percent of the line voltage with the higher magnitude events being of shorter duration than the lower magnitude events, but often with much higher energy effect. Figure 2. Basic AC power input protection circuit for end-use equipment. Figure 3. 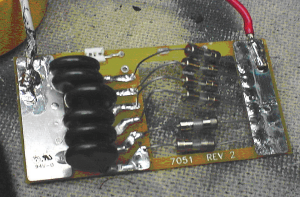 Basic low-voltage protection circuit for end-use equipment. By design, MOVs are located in various circuitry locations of end-use equipment to provide protection of the equipment from surges. To provide protection against surges incident on the AC power input of equipment, they are located at the AC power input. Although most MOV applications are on AC power input circuits, like that shown in Figure 2, they may also be used on low-voltage control wiring such as in electrically activated lawn sprinkler systems and on the inputs of dimming circuits in electronic fluorescent and high-intensity discharge (HID) lighting ballasts like that shown in Figure 3. MOVs and other SPDs located on AC power inputs and low-voltage control circuits are vulnerable to failure. MOVs are designed to absorb the electrical energy contained in surges to prevent that energy from causing damage to active and passive electronic components located downstream of the line fuse and upstream of a connection to a DC low-voltage control circuit. Upon activation by a surge voltage incident upon the AC line input, for example, MOVs effectively reduce the surge voltage to levels that will not cause damage to electronic components. In the course of dissipating energy and reducing the surge voltage, MOVs heat up, As a result, the amount of temperature rise in an MOV is related to the amount of energy that the MOV must absorb from the surge. It is the area under the curve of the resulting surge power waveform that determines how much energy the MOV must absorb. Surges of higher voltage magnitude (e.g., 3.2 kilovolts) and shorter duration (e.g., 50 microseconds) will cause less MOV heating than surges of lower voltage magnitude (e.g., 1.3 kilovolts) and the same duration. Also, larger diameter (e.g., 20 millimeter) MOVs are designed to handle more surge energy than smaller diameter (e.g., 14 millimeter) MOVs. Figure 4. 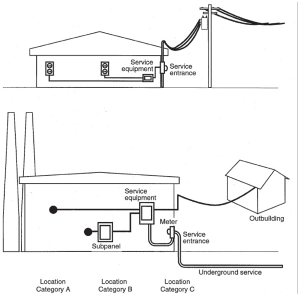 Location categories A, B, and C as defined in IEEE Standard C62.41.1-2002. In designing any MOV into end-use equipment, the energy- handling capability of the MOV is one critical factor in selecting the MOV for the application. For end-use equipment applications with a higher exposure to surges of higher energy, an MOV with a higher energy-handling capability will survive longer than an MOV with a lower energy-handling capability. If a proposed location for equipment is at a high exposure to surges of higher energy, such as Location Category C, where surge voltages in a facility are of a higher magnitude, in Figure 4, and if an MOV is undersized, then the MOV will likely fail. On the other hand, if an MOV is improperly sized for the expected surge exposure level such that it does not dissipate the resulting energy, then the equipment may still be at a high risk arising from the possible loss of the MOV. In the course of forensic analysis of failed equipment, is it possible to determine if the MOV failure was caused by surges or by TOVs? MOV failures result from the inability of the MOV to withstand the electrical energy applied to it during a surge. The energy that the MOV must absorb is a function of several variables including the maximum overvoltage occurring on line and the duration of the overvoltage. The energy-handling capability of the MOV is a function of the energy rating of= the MOV, which is a function of the diameter and thickness of the MOV, and the ability to remove the heat effectively before the MOV suffers permanent damage. Whether the overvoltage that occurs on the line voltage is a surge or a TOV, the MOV will begin to conduct current at some voltage level. The current that flows through an MOV during conduction is defined by the IEEE Standard C62.41.1 as the surge current. If the MOV must conduct current as a result of a TOV, then the resulting TOV initial current that flows may damage the MOV. As described earlier for the case of MOV conduction attributable to surge currents, MOV damage from conduction of TOV-initiated currents will depend upon how much TOV energy the MOV must dissipate. If the energy-handling capability of the MOV is exceeded, then the MOV will fail. After an MOV failure, the only way to tell whether the failure was caused by a surge or a TOV is physical inspection of the MOV and the line fuse. Little to no electrical properties will be present in an MOV after its failure. Thus, using a digital ohmmeter or an MOV tester will be virtually useless in determining the cause of an MOV failure after it has been removed from a piece of equipment. Physical inspection will require that the equipment be opened to reveal the protection circuitry on the AC power input section. Inspection of the line fuse is also necessary because the fuse also may or may not be damaged as a result of a surge or TOV. Most importantly, an opened fuse may be the result of one or more failed power electronic components in the equipment’s power supply or other power-related circuit inside the equipment with no involvement of surges, TOVs, or the MOV. After the fuse and MOV have been located, the investigator should determine if the fuse is open. If the MOV appears to be intact, then it can be removed and can be tested with an MOV tester. If the MOV test is acceptable, then it is likely that the equipment failure did not involve surges, TOVs, or the MOV. However, in testing the fuse, the investigator will need to use an ohmmeter to determine if the fuse element has been damaged and/or has opened. In most cases, it will be obvious that the fuse has been damaged as evidenced by a disintegrated fuse element and/or charred glass (if the fuse container is made of glass). In the case of some fuses, especially the ones with an inherent time delay, element damage can be “hidden”, and a visual inspection may not reveal the damage (i.e., the fuse may appear to be good, when it is actually bad).. 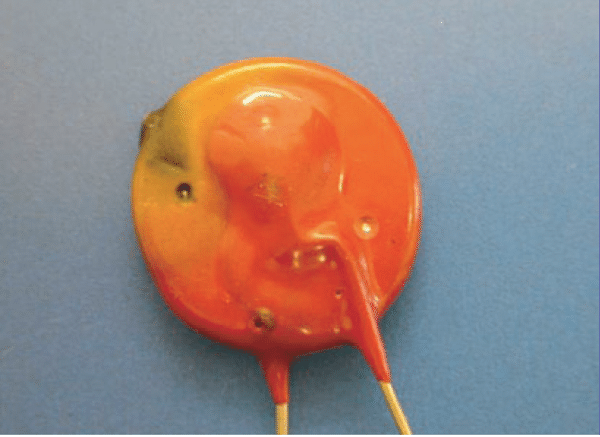 In fuse failures, it is also possible that the element has not been totally severed (i.e., it has a very small but measurable impedance). Using a milli-ohmmeter will be useful in determining if this is the case. Upon opening a piece of equipment, one may find that, in most applications, the fuse and MOV will be located on the top or on the bottom of a printed circuit board in plain sight. This location makes the visual inspection of the fuse and MOV easy. The location of the fuse and MOV will be near the point where the AC power is brought into the equipment and close to the electromagnetic interference (EMI) filter. One may also find that the fuse and MOV are not visible. In an increasing number of equipment designs where a composite EMI filter is used, the fuse and MOV may actually be inside a metal can that is used to house the EMI filter. 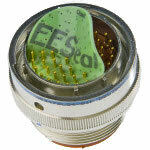 A composite EMI filter typically includes the line fuse, MOV, over-temperature protection device, and EMI filter components (i.e., capacitors and inductors). One may ask why the line fuse and MOV are included in the composite EMI filter. If the EMI filter includes an International Electrotechnical Commission (IEC)-type female connector for the AC line power cord, then the fuse and MOV must be located inside the can for the fuse and MOV to be located upstream of the input to the EMI filter. In other cases, the EMI filter may be required to be shielded from radiated emissions sources nearby inside the equipment. In these cases, the fuse and the MOV must also be located inside the filter can to preserve the electromagnetic integrity of the AC line input. Most importantly, note that the can of the filter may be filled with some type of potting material. The use of potting material helps to reduce arcing between component traces on the EMI filter circuit board and between component surfaces and the grounded EMI filter can. Potting material also helps to improve heat dissipation of the fuse, MOV, and filter elements inside the can. Dissipation of heat ability in this case is especially important in helping to extract heat from the MOV when it passes surge current. Heat dissipation through potting material will also help to reduce MOV failure caused by short duration TOVs. When conducting fuse and MOV failure investigations, the potting material must be removed to expose the surfaces of the fuse and MOV. Removal of potting material should be accomplished in such a way as not to cause further damage to the fuse and MOV. Mechanical removal of the potting material is the best method. Another benefit of the composite EMI filter is that it can act to provide a fire barrier against hot and molten material that may be expelled from a fuse and/or MOV during a failure. In cases where the fuse and MOV are inside a filter can, the investigator will have to open the can to inspect the fuse and MOV. Figure 5. 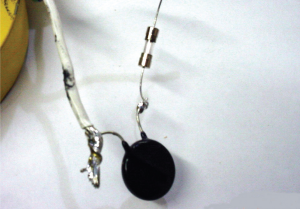 Failure of circuit traces connecting the line fuse to the MOV inside an EMI filter can. 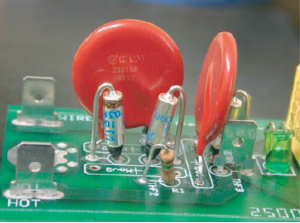 Figure 5 shows three examples of how TOVs may damage an MOV (middle) and other electronic components such as an electrolytic capacitor (left) and an inductor (right) used in a switched mode power supply. Damage to circuit traces on printed circuit boards may also occur where the line fuse and MOV are improperly coordinated. Traces may be lifted from the board due to the forces created when high currents flow. 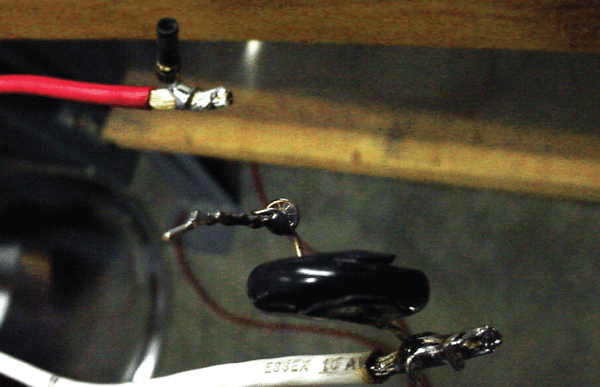 It is important to illustrate these cases because failures associated with AC line input circuitry sometimes do not result in the failure of other components in addition to fuses and MOVs. as a result of a TOV (fuse is also opened but not shown here). Figure 6 shows an example of an MOV failure in end-use equipment. This MOV is partially potted and the line fuse is fully potted (not shown). The blue capacitors below the MOV and the common mode inductor above the MOV are both part of the EMI filter for this equipment. This MOV failed as a result of a TOV incident upon the AC line input. The potting material helped to absorb heat from the MOV and helped prevent the MOV from disintegrating. The MOV failure resulted in the epoxy coating of the MOV being pushed away from the surge absorbing material. This fuse and MOV failure resulted in full equipment failure resulting in the necessity of returning the equipment to the manufacturer. equipment fire in a surge protective device. equipment fire in another surge protective device. 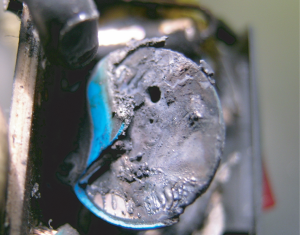 In visually inspecting MOV failures, thermal runaway may also occur if an MOV with too low of a maximum continuous operating voltage (MCOV) is applied in end-use equipment. In such a case, exposure of the MOV to a longterm overvoltage may be higher than the maximum allowable voltage for the MOV, and thermal runaway of the MOV may occur without blowing the line fuse. 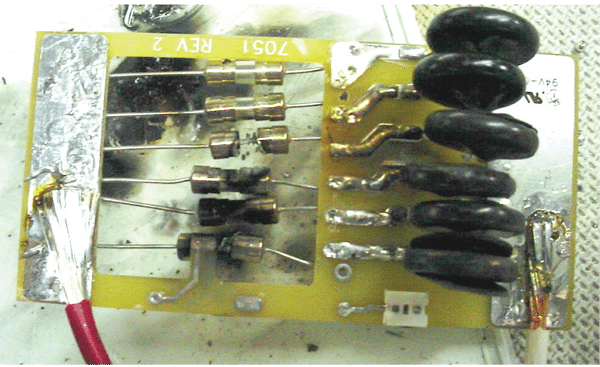 Figure 7 and Figure 8 show two examples of MOVs in surge protectors that failed as a result of MOV thermal runaway. In both examples, the MOV ignited and a significant part of the MOV material was burned by the fire caused by its own thermal runaway. 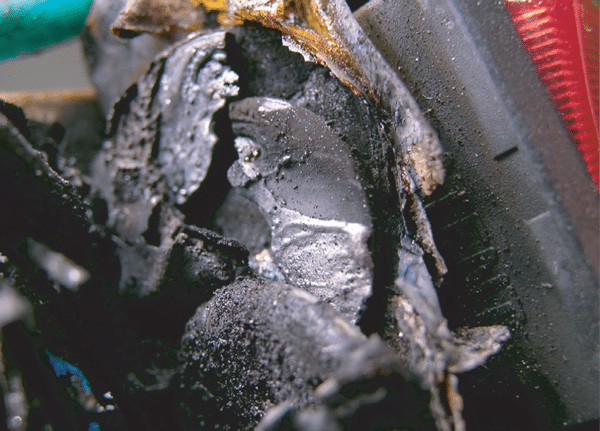 If an investigator discovers this type of MOV failure surrounded by other burned insulation and electronic components, then thermal runaway can be suspected. Design requirements imposed by Underwriters Laboratories (UL) require that the fuse be located upstream of the MOV. In MOV applications where equipment immunity from surges occurring from line to neutral is desired, the fuse location requirement imposed by UL is required because the MOV is connected from a source of power (i.e., line) to neutral. 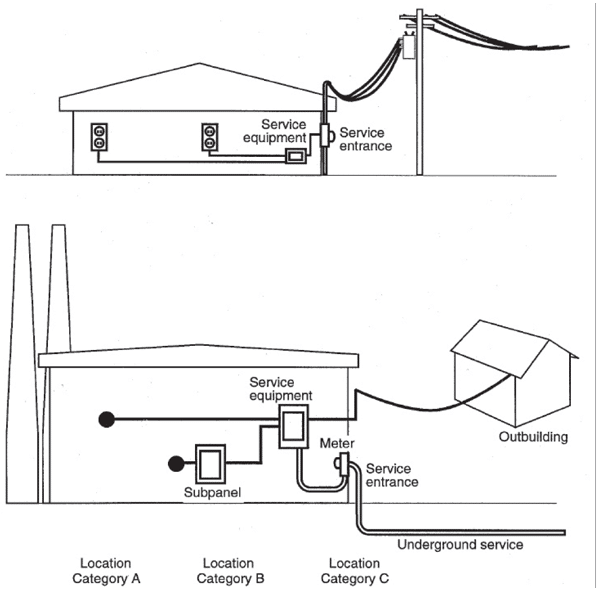 The same is true for MOVs connected from line to ground when surge immunity from line to ground is required. MOVs connected from neutral to ground do not require fuse protection. Fuse protection of an MOV will reduce the likelihood of an MOV fire resulting from extreme surge currents flowing through the MOV. The neutral to ground MOV should have the same MCOV rating when selecting MOVs. Also, it is good design practice to thermally protect the MOV to prevent potential fire hazards due to loss of neutral in facility wiring systems. Some manufacturers with little experience in surge protection design will try to locate the MOV upstream of the fuse in their equipment designs. Without the basic understanding of protecting equipment from fire caused by MOV failures, initially there is more concern with either protecting every component (including the line fuse) from surges and reducing the number of nuisance equipment failures caused by opened fuses. Locating the MOV upstream of the fuse would reduce nuisance equipment failures but would also violate UL requirements. Thus, this practice is not allowed by UL or recommended by the power quality community for obvious reasons. 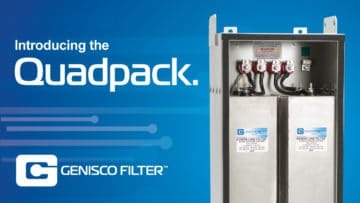 Nuisance equipment failures (caused by opened fuses and failed MOVs) can be avoided and adequate immunity against surges can be provided if the overcurrent protection offered by a fuse and the overvoltage protection offered by an MOV are sized and coordinated in the proper manner. Figure 10. A ceased MOV failure caused by interruption of the conduction current by an external TCO (adapted from Littlefuse, Inc.). An improved MOV design provides for thermal protection for the MOV without the use of coordinating fuses. Thermal protection and prevention of complete MOV destruction are provided by embedded thermal cut offs (TCOs), which are available in different opening temperatures. This new type of MOV is called the TMOV. The TCO must be positioned and oriented with respect to the MOV if it is to be effective in thermally protecting an MOV. When subjected to a TOV, MOVs can short at a random point on the disk and can begin to self-heat rapidly when conduction current is sustained through the MOV. Figure 9 illustrates an example of a typical arrangement of MOVs and TCOs. Figure 11. A ceased MOV failure caused by interruption of the conduction current by an internal TCO (adapted from Littlefuse, Inc.). In recognizing MOV failures, it is worthwhile to illustrate the prevention of an MOV failure that was caused by including an external TCO next to the MOV. Figure 10 illustrates this type of failure. TMOVs are also available with internal TCOs. Figure 11 illustrates how an MOV might look when its conduction current is interrupted by a TCO internal to the MOV. Figure 12. Location of MOV critical v voltage ratings on a voltage magnitude-duration plot. 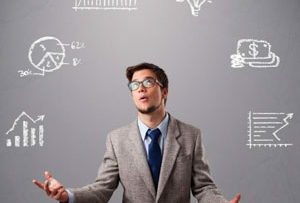 It is not uncommon for manufacturers to receive dysfunctional equipment from the field. Upon failure investigations, manufacturers often find that only the line fuse has been blown with no damage to other components including the MOV. Manufacturers know that there are a number of causes for line fuse failure including internal component failure especially associated with the power supply. In other cases, manufacturers may find that both the fuse and MOV have been destroyed. However, most manufacturers do not think about line fuse failures caused by overcurrent conditions resulting from surges, TOVs, and even inrush currents that occur during a surge or after the return of line voltage after a voltage sag or momentary interruption, respectively. Surge- and TOV-related line fuse failures, addressed in this article, are caused by MOV current conduction. This conduction is a function of the MOV clamping voltage rating of the MOV. If the MOV clamping (suppression) voltage (CSV) is selected too low, then there is a greater chance that the MOV will conduct as a result of a TOV, thus possibly damaging the line fuse and the MOV. The maximum continuous operating voltage (MCOV) rating of an MOV is also another critical specification for MOVs. If the MCOV is selected too low (i.e., too close to the maximum expected line voltage including the expected overvoltage of about 10%), then the MOV will conduct as a result of high line voltage. Figure 12 illustrates an example of the CSV and MCOV rating with respect to the areas in a voltage magnitude-duration plot where surges and TOVs typically occur. In this situation, the MOV is likely to experience thermal runaway (see Figures 7 and 8) and to be damaged, possibly causing a fire inside the equipment. Thus, selecting an MOV with a high CSV and MCOV rating will help avoid line fuse and MOV failures caused by high line voltage conditions and TOVs. On the other hand, the equipment designer must select the clamping voltage low enough to clamp surges before they damage other internal components such as noise capacitors inside an EMI filter and the bridge rectifier. In 120-volt applications, selecting an MOV with a CSV of 395 and a MCOV of 150 will be sufficient. In 277-volt applications, selecting an MOV with a CSV of 845 and a MCOV of 320 will be sufficient. Well-planned laboratory surge and TOV tests may be carried out to investigate surge- and TOV-related failures and failure prevention through coordination of line fuses and MOVs. Coordination studies may be aimed at identifying coordination of existing designs with too many fuse and/or MOV failures or targeted coordination for new designs. A single line fuse connected in series with a single MOV may be subjected to various surges and TOVs of various duration to learn more about how to recognize fuse and MOV failures. Single fuse-single MOV and grouped fuse-MOV test circuit configurations should be used to determine coordination. Table 1. 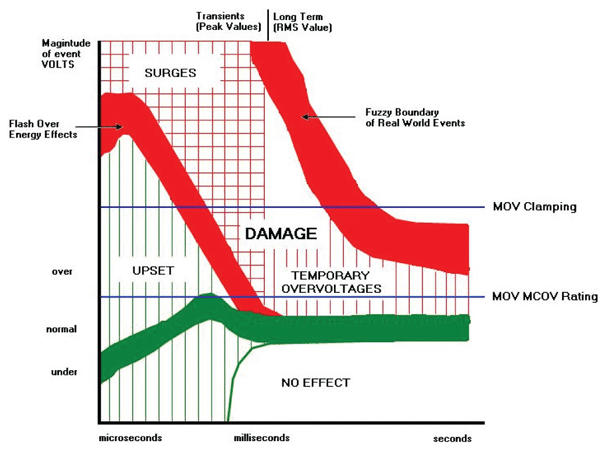 Approach for determining fuse and MOV damage resulting from surges and TOVs. Table 1 illustrates an example approach for conducting surge and TOV tests (1) on series-connected, single-line fuse-MOV samples, (2) on series-connected line fuse-MOV samples connected in parallel, and (3) on end-use equipment containing a line fuse and MOV. A selected number (e.g., six in these tests) of circuits with a single fuse and a single MOV may be placed in parallel on a test card to investigate how the fuse-MOV combination shares the real overcurrent condition presented by the surge or TOV. This circuit configuration simulates end-use equipment powered by an actual branch circuit in a facility. The number (“X” in the third column of Table 1) of circuits with a single fuse and a single MOV included on a test card can be determined, for a specific enduse equipment application, by determining how many pieces of like equipment can be placed on a single 20-amp branch circuit, for example. In an application where one piece of equipment draws 1.3 Arms at 277 Vrms, 12 pieces of equipment can be placed on a 20-amp circuit (derated to 16 amps). Thus, 12 series circuits with a single fuse and a single MOV can be placed in parallel on a test card for laboratory testing. Table 2. Summary of TOV test data for the line fuse and MOV tested in this case. Table 3. Summary of surge test data for the line fuse and MOV tested in this case. Figure 13. A 3-amp, slow-blow 350-volt line fuse and 510-volt MOV after one 1.71 p.u. (473.4 V rms ) 64-cycle duration TOV: disintegrated fuse and MOV damaged (epoxy surfaces lifted). Figure 14. Six parallel arrangements of 3-amp, slow-blow fuses in series with 510 volt MOVs on a test card after one 1.71 p.u. (473.4 Vrms) 64-cycle duration TOV: four out of six fuses blown with three out of six MOVs damaged (epoxy surfaces lifted). Table 2 illustrates the summary of TOV test data for the 3-amp, slow-blow line fuse and the 510-volt, 20-mm MOV tested in this example case. The arrows in the tables illustrate how the testing was performed. Table 2 contains test data for the single line fuse-MOV sample case and for the group of six series line fuse-MOV samples in parallel. In the TOV testing, TOVs from 1.0 p.u. (per unit) to 2.0 p.u. were planned in steps of 0.1 p.u. with TOV duration starting at 2 cycles and ending in 64 cycles in double steps. In Table 2, one can see that for both cases (single and grouped line fuse and MOV), the line fuse-MOV combination survived the TOVs ranging from 1.0 p.u. at 2 cycles up to a 1.7 p.u. TOV at 32 cycles with failure of the fuse and MOV at 1.7 p.u. at 64 cycles. 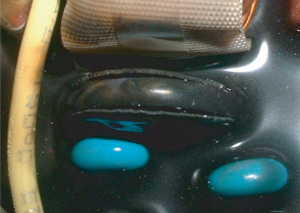 From Figure 13, one can also see that the line fuse was completely destroyed and that the MOV suffered splitting of its epoxy-covered case. (The MOV was not completely destroyed in terms of its physical structure.) Figure 14 illustrates the results of conducting these tests on parallel-connected line fuse-MOV circuits. Four out of six fuses were blown. Figure 14 also shows that the fuses that suffered the greatest destruction were also supporting TOV current drawn by the MOVs that experienced the most damage resulting from the TOV event. The four fuses that suffered physical damage to their outside cases supported TOV current from the four MOVs that suffered splitting of their epoxy cases. Figure 15. A 3-amp, slow-blow, 350-volt line fuse and 510-volt MOV after one 2.5-kV surge: opened fuse, no damage to MOV. Figure 16. Six parallel arrangements of 3-amp, slow-blow fuses in series with 510-volt MOVs on a test card after 39 5.5-kV surges: five out of six fuses blown with no MOV damage. 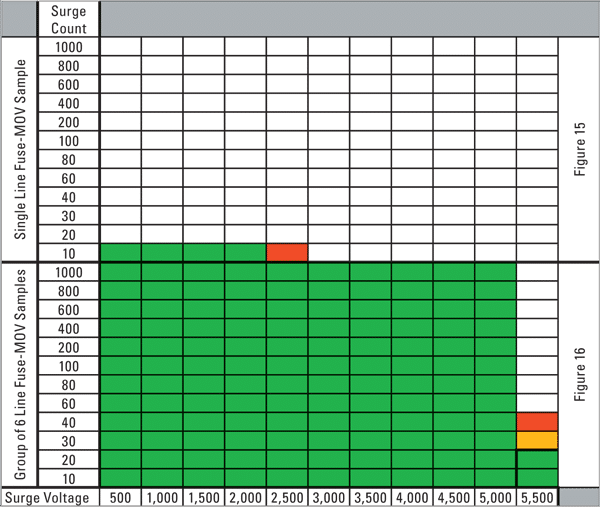 Table 3 illustrates the summary of surge test data for the same 3-amp, slow-blow line fuse and the 510-volt, 20-mmMOV tested in the second part of this example case. Table 3 contains test data for the single line fuse-MOV sample case and for the group of six series line fuse- MOV samples in parallel. In the surge testing, surges from 500 volts to 6000 volts were planned in steps of 500 volts with surge counts (number of surges) starting at 10 and ranging up to 1000. From Table 3, one can see that the test results are different for the single and the grouped line fuse-MOV cases. In the single line fuse-MOV case shown in Figure 15, the line fuse-MOV combination survived the surges ranging from 500 volts at 10 surges up to 2500 volts up to 10 surges with failure of the fuse at 2500 volts at 10 surges. In the grouped case where the line fuses and MOV share the surge current, five out of six line fuses failed when subjected to 40 surges at 5500 volts. No damage to any of the six MOVs occurred in these tests. 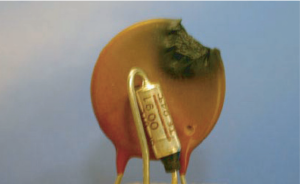 From Figure 16, one can also see that the line fuses suffered no physical damage to their outside cases (only the fuse element was blown for the five out of six fuses), and the MOVs also suffered no damage (splitting or destruction) of their epoxy covered cases. The surge and TOV electrical disturbance events are two completely different types of events. As stated earlier, MOVs are designed specifically to reduce surge voltage appearing on input and output circuits in end-use equipment. When surge voltage is reduced to acceptable levels that will not damage internal end-use electronics, surge currents must flow as a result of the voltage clamping action designed into the MOV. However, MOVs are not designed to protect end-use equipment from TOV events. Although TOV events are lowervoltage events, they are much longer in duration than surges. In equipment design, the size and type of fuse and MOV does matter when trying to coordinate the fuse and MOV where the objective is to reduce premature return of failed equipment that otherwise would have continued to operate. As a result though, when the fuse is coordinated closer to the MOV, meaning the fuse is able to withstand the resulting surge current, it is difficult to determine the failure mode (failure caused by surges or TOVs). However, it is very clear where there are multiple failures of like pieces of enduse equipment such as power supplies and corresponding catastrophic fuse failures that it is very probable that the cause of equipment failure is related to TOV events, either internal or external to the facility. In cases where there are two pieces of end-use equipment out of a group of equipment found with benign fuse failure, but not catastrophic, it is reasonable to conclude that the failure is related to a surge event when no other failed components are determined. Effects of Temporary Overvoltage on Residential Products, Part II: System Compatibility Research Project. EPRI, Palo Alto, CA: 2005. 1010892. Martzloff, F. D., and Leedy, T. F., “Selecting Varistor Clamping Voltage: Lower is Not Better!” Proceedings, International Zurich Symposium on EMC, 1989. Phipps, Kermit O., and Connatser, Bradford R., “Understanding MOVs for Applying Robust Protection Against Surges” Interference Technology EMC Directory & Design Guide, 2005. Traynham, Paul W., “Using Thermally Protected MOVs in TVSS or Power Supply Applications” Littelfuse®, Inc., 2001. Philip F. Keebler has conducted System Compatibility Research on personal computers, lighting, medical equipment, and Internet data center equipment. The lighting tasks were associated with characterizing electronic fluorescent and magnetic HID ballasts, electronic fluorescent and HID ballast interference, electronic fluorescent and HID= lamp failures. He has drafted test protocols and performance criteria for SCRP tasks relating to PQ and EMC. Mr. Keebler also manages the Electromagnetic Compatibility (EMC) Group at EPRI Solutions where EMC site surveys are conducted, end-use devices are tested for EMC, EMC audits are conducted, and solutions to electromagnetic interference (EMI) problems are identified. He has completed his service as editor developing a new EMC standard for power-line filters, IEEE 1560. Kermit O. Phipps is a NARTE Certified EMC engineer and conducts tests and evaluations of equipment performance in accordance with standards of ANSI/IEEE, IEC, U.S. Military, and UL, as well as with the EPRI System Compatibility Test Protocols for EPRI Solutions. He conducts research on surge protection, power-line filters, shielding effectiveness, and electromagnetic interference. Mr. Phipps is the author and co-author of test plans, protocols, and research papers presented at international power quality and EMC conferences. Most recently, he has completed his voluntary work as chairman in developing a new EMC standard for power-line filters, IEEE 1560. Doni Nastasi is responsible for managing projects, power quality testing, field investigations, equipment design, and power quality training. Since joining EPRI Solutions in 1992, Mr. Nastasi has designed electronic circuits and developed software to improve laboratory testing capabilities. He designed an automated flicker measurement system, performed on-site flicker investigations at customer sites, and performed flicker tests on incandescent lamps and fluorescent ballasts for EPRI System Compatibility Research projects. He has used EPRI Solutions’ portable sag-testing equipment to perform more than 50 on-site power quality investigations at industrial facilities. He has contributed to corporate publications such as Power Quality Briefs, Case Studies, and Applications, and has co-authored technical papers on topics such as voltage sags, surges and flicker.